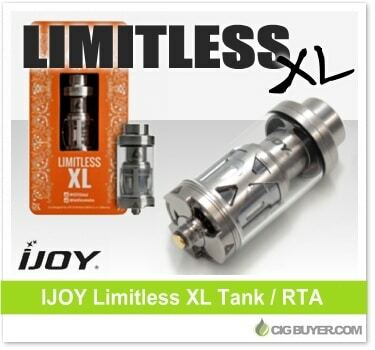 IJOY and Limitless have teamed up again, this time to bring you an awesome sub-ohm tank / RTA combo – the IJOY Limitless XL Tank. It comes with a 0.15 ohm “light up” coil (50 – 215W) that glows on the base as you fire, but it also includes two huge, easy-to-swap 19.8mm RTA build decks – one for single and one for dual coil configurations. The IJOY Limitless XL Tank is top-filled, has 4ml of capacity and features quad wicking ports with a direct to coil, fan-styled airflow control ring that’s designed to be completely leak-free.